What a year for The Edge and what a time to be running a cultural organisation! Arguably it’s never been harder to sustain an Arts charity, certainly it’s never been so important. This year we’ve worked with so many people who are struggling, people who are lonely or isolated, people who, by taking part in creative activities have been able to make real and positive changes in their lives. As Manchester’s Award Winning Theatre for Participation, The Edge has become a go to destination for individuals, groups and referral agencies, providing a safe and welcoming space for people from all backgrounds to come together and enjoy the wonders that taking part – either as participant or spectator - in culture can bring. Founded in 2011, The Edge is a thriving and accessible cultural hub, creating and presenting highquality theatre and performance, and delivering a rich programme of meaningful and life changing participatory activities. The Edge is Chorlton’s first designated performing arts space and has successfully captured both its local community and a wider Greater Manchester audience in its reach. The work of the company is informed by a simple principle: that everyone should have access to the Arts as a basic human right. We believe that the higher the quality of the work, the richer and more rewarding the experience, whether that’s as spectator or participant. 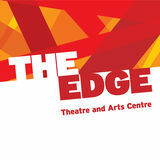 The Edge produces theatre which is inclusive, inspiring, irreverent, joyful and full of hope. We engage babies to elders and everyone in between. We create opportunities for vulnerable adults and children to improve their life chances by becoming active creative citizens. We run classes and courses for Manchester’s residents to develop their creative skills and improve their health and wellbeing along the way. We provide space for Manchester’s creative professionals to develop their craft and to create new work. 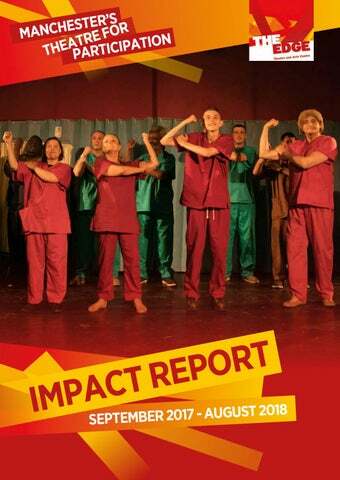 The Edge is many different things to many different people, and we hope that this Impact Report gives you an insight into not only the range of work that we carry out, but also the effect that this work has had on people’s lives. What we did in 2017/18 The Edge is home to exciting world class theatre, new writing and musical journeys, stimulating and inclusive programming, inspiring and imaginative collaborations, and irreverent and hopeful stories. We work with vulnerable adults, emerging artists and world class theatre practitioners to deliver this vision. Y R O T A P I C I T R A P E OUR M M A R G O R P Our Partnership with The Booth Centre The Edge runs regular drama and singing workshops at the Booth Centre for people who are homeless or at risk of homelessness. Together we have created a unique company making high quality theatre. We work with the Booth Centre to produce 2 shows a year which are performed at The Edge. The productions provide opportunities for friends, family, others with experience of homelessness and the staff that support them to see participants achieve. Our work profiles the impact of making theatre with vulnerable adults and challenges the public’s perception of a person who has found themselves homeless. It proves that there is so much more to people than their current situation. I found myself homeless two years ago, whilst I was at university. I fell in with a bad crowd, and lost everything. I slept rough on doorsteps, in tents and under bridges. It felt awful, it was lonely. I had nobody and nothing. I heard about the Booth Centre, and eventually I knew I needed to make a change and I visited the Centre for some help. Soon I became involved in the weekly drama sessions. Drama is something I’ve done since school, so it was so good to be given the opportunity to get back into acting. The sessions with Janine from The Edge gave me the chance to forget my problems for a few hours, concentrate on something I’m good at, and the chance to be someone else. My confidence has really improved. I am now going back to university to study film. I’ve got a bounce back in my step and a smile on my face, it feels like I’ve found myself again. I’ve learnt a lot from being part of the Booth Centre and the drama project particularly. It’s great to be in accommodation now, and working towards getting myself sorted. I could complain about the things that have happened in my life, or I could see it as life’s lessons and look to the future, which is what I’m doing. Thank you to everyone who has been there, because without them, I wouldn’t be. E G D E E V I S S E R P EX Expressive Edge is our theatre company for adults with learning disabilities and has been running at The Edge since 2011. The company is led by Nikki Mailer, one of our drama specialists. 16 learning disabled actors attend weekly sessions at the Edge, topped and tailed with tea and biscuits. The sessions include: theatre games to develop speaking and listening, working as a group, concentration, focusing and fun; improvisation to develop creativity, spontaneity and imagination; devising to develop planning and thinking skills; and performances to develop presentation skills, confidence/self-esteem and to give our participants a platform to talk about what matters to them. Since its inception, Expressive Edge has formed a core part of our activities at The Edge and most of the actors have been with us from the beginning. This has given us a chance to get to know them as individuals and for them to get to know us, feel safe and to achieve a real sense of ownership of The Edge. The group work towards 2 shows a year and these productions give families an opportunity to see the actors achieving and flourishing in a way that other, more formal and less creative activities may not be able to do. R A E Y S I H T INTRODUCED EXPRESSIVE TOO We set Expressive Too up in April 2018 in response to a growing waiting list for Expressive Edge. Every Monday learning disabled actors come together in a safe space to explore their creative potential, raising their confidence and self-esteem and creating friendships within the group. Using theatre techniques, they work on devising and performing in a setting where everyone is welcomed and valued for their efforts and achievements, giving the actors a real sense of achievement and a boost in confidence which can be applied to other areas of their lives. Stepping Out is our new dance company for adults with learning disabilities which started in April 2018 Working with professional dancer and facilitator Susan Swanton, learning disabled adults attend regular weekly dance sessions to explore different dance styles, work as a group, devise different dances, improve focus, improve coordination, physical health and fitness, develop performance and presentation skills develop confidence and self-esteem. The Longford Centre in Chorlton is a homeless prevention centre run by Manchester City Council. The Edge has developed a strong relationship with them, running a series of acting for confidence workshops with residents in the centre. MY EDGE My Edge is the new programme for residents in the Merseybank and Arrowfield areas in Chorlton. Working with local councillors and Barlow Moor Community Centre, this programme gives residents access to a range of creative activities, discounts to our theatre and special offers in our café. E R T A E H T OUR We make theatre for people to watch and for people to take part in. We believe in the power of stories to provide hope, meaning and a compass to help navigate a way to a better life. Our own productions are made by The Edgeâ&#x20AC;&#x2122;s creative team: writer and director Janine Waters and composer and musical director Simon Waters, working alongside performers from all backgrounds and integrating the worlds of participation and professional theatre. The Edge is Manchesterâ&#x20AC;&#x2122;s Theatre for Participation and provides practice based training and creative professional development for actors, musicians, dancers and applied theatre practitioners to make high quality, entertaining and ethically sound theatre with vulnerable adults and young people. Our Theatre is a unique space to see some of the best high-quality, small-scale, theatre from around the country. MUM’S THE WORD Hosted by Award Winning writer, comedian and Mum Katie Mulgrew, Mum’s The Word is a monthly lunchtime comedy club for parents to bring their babies along to. R O F S E ITY S R U O N C U & M S M E O S C S L A A L C E LOC TH The Edge runs a full programme of creative classes and courses for the local community to get involved with. Each week 658 people take part in an arts activity at The Edge. Each term we run a range of classes and courses for the local community, from ukulele to acting, tap to singing. Trainees complete 12 week one to one personalised training from our learning mentor in hospitality and catering for 2 hours each week. Between September 2017 and August 2018, 23 participants completed the Dressing Room training, developing a range of skills including in safety in the workplace, health and safety, food hygiene, customer service and handling money.